What a good time to have been invited by Mirella Patzer to be a guest blogger at Historical Novel Review. People have commented on the difficulties of writing a historical novel in attempting to keep the facts accurate. I’m new to this historical mystery thing, being mainly a writer of contemporary police procedurals, specifically the Smith and Winters series from Poisoned Pen Press. 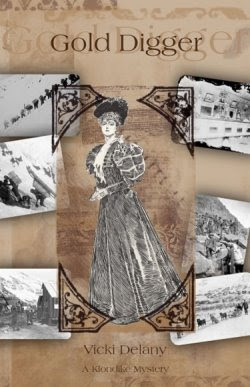 Canada’s Rendezvous Crime has just released Gold Digger: A Klondike Mystery, the first book in my new series set in Dawson, Yukon Territory, in 1898, during the Klondike Gold Rush. I’ve long considered the Klondike Gold Rush to be an incredibly interesting historical event. Not the least because it stood at the exact end of the 19th century (1896 –’99) and the beginning of the ‘modern’ world. The Klondike Gold Rush has been called the Last Great Gold Rush, last because once the twentieth century began, industrialization and corporations pushed out free-wheeling independent prospectors and gold-seekers. It was perhaps the last time in North America when thousands of people could simply leave home, sell everything, and set off – on foot! into the wilderness in the hopes of making a fortune. I’m fortunate in that the Klondike was extensively photographed. One of the reasons the Klondike Rush is so well known is that it was the only one of the gold rushes to leave a rich photographic record. The age of photography was just beginning, and the camera was becoming portable enough to be transported out of a confided studio and stiffly posed portraits to come into the street (and to the gold fields) and capture scenes and people unaware. I guarantee that you’ve seen some of the iconic photographs (think Alaska license plates). So the history is well-documented, and well-photographed, to give me plenty of sources to ensure historical accuracy. And I have tried to be as accurate as possible. There was not one single murder in the town of Dawson, Yukon Territory, during 1898 – the year that 40,000 people flooded into town. In contrast to the nearby town of Skagway, Alaska, where gangsters such as Soapy Smith ruled and crime and corruption was rampant. The law, in the form of the North-West Mounted Police, precursors to the RCMP, was already in the Yukon before tens of thousands of people began flooding in to search for gold, and thus the rule of law was in place. The boundaries between the U.S. and Canada were still in dispute at the time, and the government had sent the NWMP to strengthen its claim to the territory. The police enforced the laws strictly – no one was allowed in from the U.S. without a year’s supply of goods (a lesson from the winter of ’97-98 when the town was on the verge of starvation), everything closed on Sunday for the Lord’s Day, vile language was not allowed, guns were strictly banned. At the same time the police realized that some things needed to be permitted in order to keep the peace in a town full of miners and gold-hunters. Therefore, although prostitution and gambling were illegal in the rest of Canada, they were permitted in the Yukon, but kept under close police supervision. This is important historical stuff, and largely contributed to the image of Canada as a peaceful, law-abiding place that the country enjoyed for much of the twentieth century. In order to create a mystery novel, which some people call a ‘murder mystery’ I had to jettison the sterling record of the NWMP and create a murder. In the second book in the series, Gold Fever, there will be two. And, despite one of the main characters being a NWMP Constable, the Mounties will prove unable to solve the crime and it will be left to my protagonist, Fiona MacGillivray, to do so. Sometimes, you just can’t let the facts get in the way of a good story.